The staple dal of my childhood was a yellow, insipid affair. A small bowl of yellow lentils, presumably toor dal, that showed up on my plate day after day, usually tempered with ghee and cumin seeds and turmeric. Monotonous and never-changing and nothing of what I wanted or missed when I came to the United States. It was left behind with the food that I was required to eat, with my mother’s “finish what is on your plate” instructions. I was ready to make my own food choices. That is until I met my husband, who despite his willingness to take me to any restaurant and sample any cuisine, would sometimes remark, just in passing “I long for rice and dal.” It took me a little while to pick up on this statement. The years in college and those spent working long hours and living in a matchbox apartment in New York city had not advanced my relationship with lentils. I had almost forgotten that they existed. One reason for our estrangement was that I found it difficult to cook them. I had never paid attention to how lentils were made at home in Calcutta and distantly recollected an ugly snorting hissing aluminum pressure cooker. In my New York apartment, boiling lentils in a regular pot seemed to take hours and yielded lots of scum that had to be scooped away from the top of the pot. The plain dal, with a simple tarka of ghee and cumin didn’t taste that exciting either. Other things were needed to complete the meal: some kind of vegetable sabzi, rice and yogurt. Too much to ask of one person in a tiny apartment cooking for herself. When my husband came along, things changed. Now here was someone, brought up in the proper South Indian way, who ate rice and sambar and yogurt, and could effectively wield a pressure cooker. Once I learned how to boil toor dal in under fifteen minutes with three whistles in a pressure cooker and 3:1 ratio of water to dal, the seasoning of the dal followed quickly. I found that no matter what I did, the versatile and encouraging dal tasted great. First with a basic tempering of ghee and heeng, and cumin seeds and turmeric. Next bits and pieces of other things into the sizzling ghee. Onions. Ginger. Garlic. Tomatoes. Coriander leaves. Green chillies. Dried red chillies. Fresh green curry leaves. Black mustard seeds. Any or all of these. My experiments grew bolder. Next came different dals: yellow split moong, orange split masoor. More recently peas and beans such as red kidney beans and black eyed peas and garbanzo beans. Along the way, I also realized that some dals, like split yellow moong and split orange masoor, boiled quickly and directly on the stove without the use of a pressure cooker. The recipe below is a Gujarati style chana dal made with chunks of zucchini instead of the more traditional lauki. Zucchini is so readily available in farmer’s markets during the summer that I am trying to tuck it wherever I can. This dish is comforting and is a one pot meal, to be eaten with rice or roti. 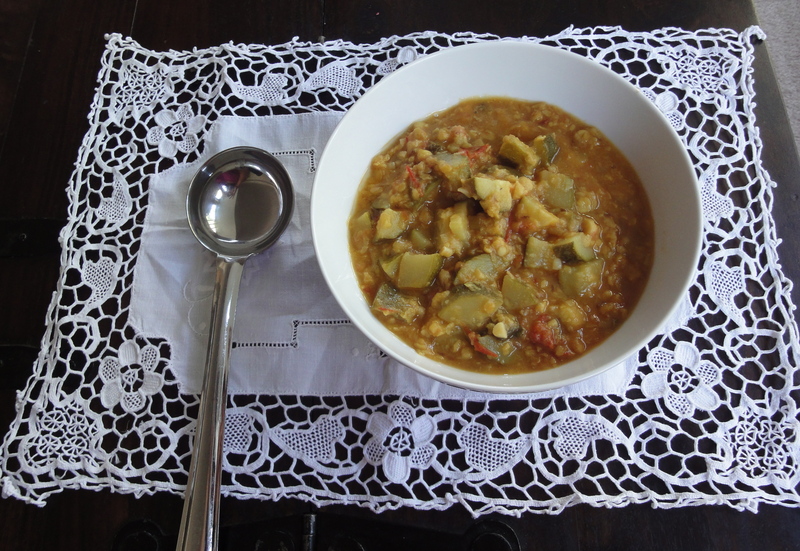 The dal provides a chunky and hearty base for the sweet-tart tomatoes, mild juicy green zucchini and earthy garlic. 1. Heat the ghee in a heavy-bottomed saucepan and sputter the asafoetida, mustard seeds and cumin seeds. Add the onions and cook for a few minutes until the onion is translucent. Add the ginger and garlic and cook for a few seconds. Next, add the tomatoes and cook until the tomatoes release oil and do not taste raw anymore. Now toss in the zucchini and the boiled chana dal, with plenty of water, along with turmeric, cayenne pepper, cumin and coriander powder, and jaggery, if using. Add water (depending on how thick the dal is) and bring to a boil on medium heat, stirring occasionally. Keep boiling for several minutes until the zucchini is soft. Add salt to taste and serve with rice or roti. Your story reminds me of the Ganga-water style Masoor dal my mohtre wielded with the same instruction. This looks delicious! devika, i really have to try this out. love reading your blog and it truly inspires me, just have to get organized enough to implement the recipe. Very Innovative Combo! Definitely try this 2morrow! Love all types of Lentils…so more Recipes Plzzzz! Thanx….